Racers were aggressive all through Round Eight, but nothing proved more decisive than the final climb and hilltop finish. Most of this 36-kilometer London route takes riders on flat or gently rolling roads. It all leads up to a climb up Keith Hill – the back side of Zwift’s version of the real Leith Hill. This 4.4-km long climb has a 5% average gradient, but it’s not steady. Near the beginning of the climb, the road flattens and even takes a short descent before rising again. The 8% average gradient after that can get up to a very steep 12%. At the crest of the climb, racers can’t relax. 700 meters of false flat (slightly uphill) road remain before the finish line. All eyes were on the hilltop finish this week. Would the racers wait and save their energy until then? A flurry of attacks began in the first few kilometers and continued well into the race. Some riders were trying to break away, while others wanted to see who was hurting at the back. James Fouche (Team Wiggins-Le Col) was the first to fly off the front on one of London’s short rolling hills, but it didn’t last long. He kept trying multiple times throughout the first 15 kilometers. Finally, he broke away and pulled out out a gap of about 8 seconds. Fouche rode on his own for a few minutes, but he had nobody else with him to help, and the peloton eventually brought him back. 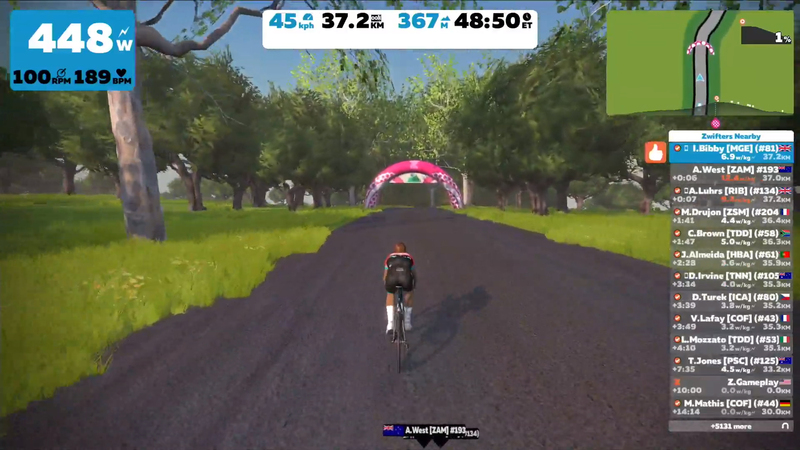 Ollie Jones (Zwift Academy Dream Team) also put in multiple digs and spent some time in solo off the front, earning himself the "Most Combative Rider" award. Alex Luhrs (Ribble Pro Cycling) and Jon Mould (Madison Genesis) broke away on a short kicker with 12 km to go, getting a small gap. Alex West (Zwift Academy Dream Team) just managed to bridge to them before the Zwift Academy All Stars closed it down. In spite of these strong efforts, the group came back together each time. There were still about 40 riders in the group approaching the base of Keith Hill. Fewer racers were getting caught out by surges than in earlier rounds. As the road turned uphill, Luca Mozzato (Dimension Data U23) launched a hard attack with a feather PowerUp! Unfortunately for him, it was just before the road flattened out again. The lightweight bonus from the PowerUp wouldn’t help much here. The bunch caught him as they started the official climb. Jones set a steady, hard pace at the front of the peloton at the base of the climb. Ben Healy (Team Wiggins – Le Col) tried to get away, but Jones quickly went after him and took his spot back in front. Several seconds later, Mould attacked, quickly getting a gap on the group behind. 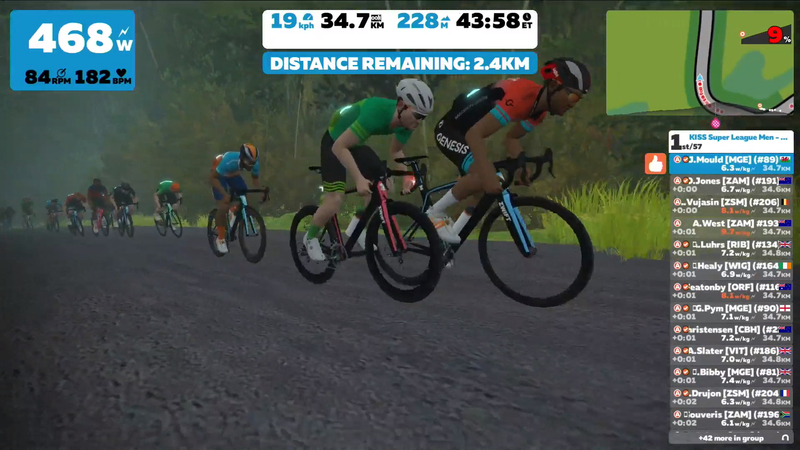 Jones and Lionel Vujasin (Zwift All Stars) closed it down. Then it was West’s turn, and Vujasin pursued the attack again. This time, Jones was not going to help catch his teammate. Luhrs took up the chase with Vujasin instead. Lower down the hill, the group splintered and wide gaps started to form. The riders reached one of the steepest sections about halfway up the climb. Ian Bibby (Madison Genesis) saw an opportunity. He used a feather PowerUp and rocketed past the first few riders to take the lead. West and Luhrs tried to catch on, leaving Jones and Vujasin behind. The pair could still see him just up the slope – only 4 seconds ahead, then 5, then 7 as they crested the hill. Bibby kept them at bay, and his climbing strength gave him his third victory. 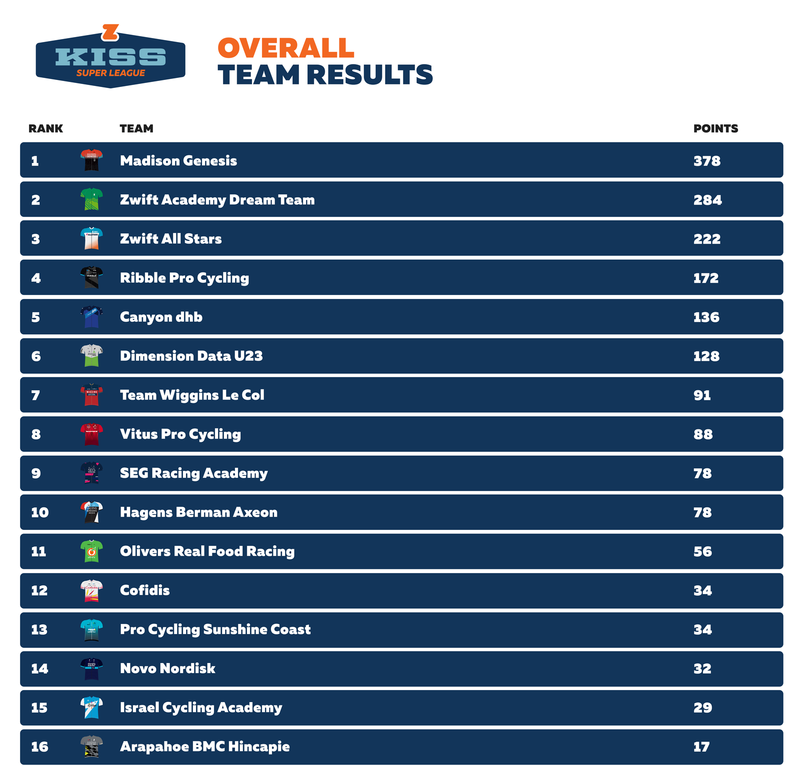 Out of 8 rounds in the men’s KISS Super League, Madison Genesis have won 5! 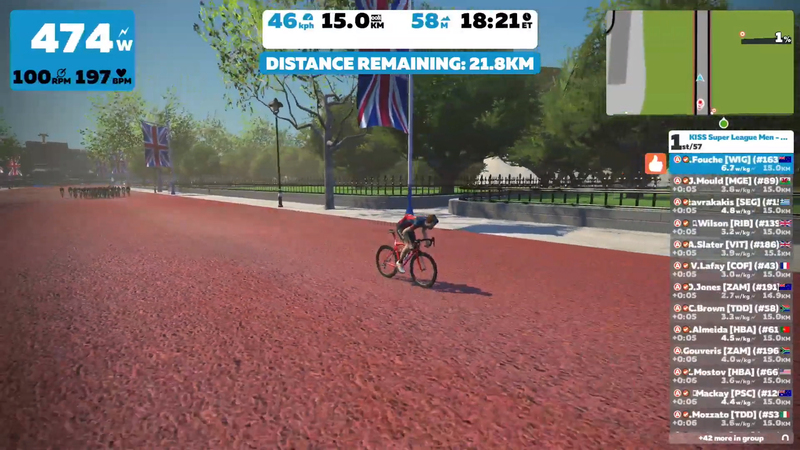 Bibby says his team races the league to win, but Zwift racing can also be great training between longer rides. “I use it all winter and have often won the first IRL (in real life) race of the year, and UCI races, off the back of Zwift racing,” he said. With no aero helmet PowerUp for a sprint, Bibby knew he could be in danger if he was with other riders at the top of Keith Hill. On the less steep sections, they could still save some energy in his slipstream. Vujasin said covering the previous attacks on the climb had worn him out. When Bibby rode away, he focused on riding his own pace. 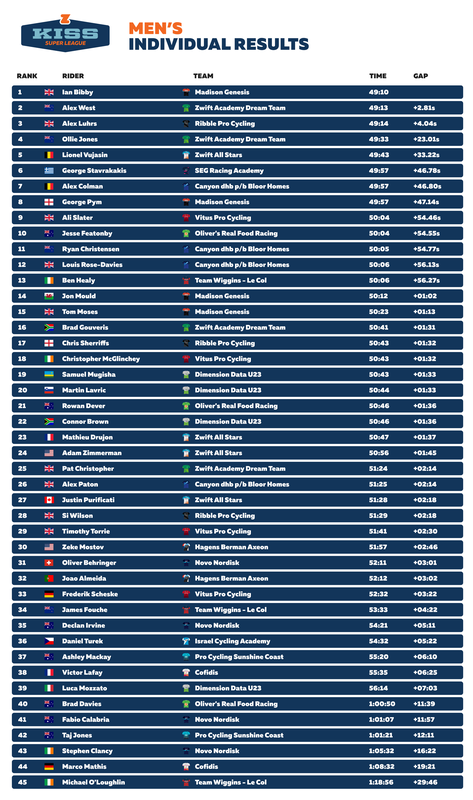 Madison Genesis retains a solid lead in the overall team competition. 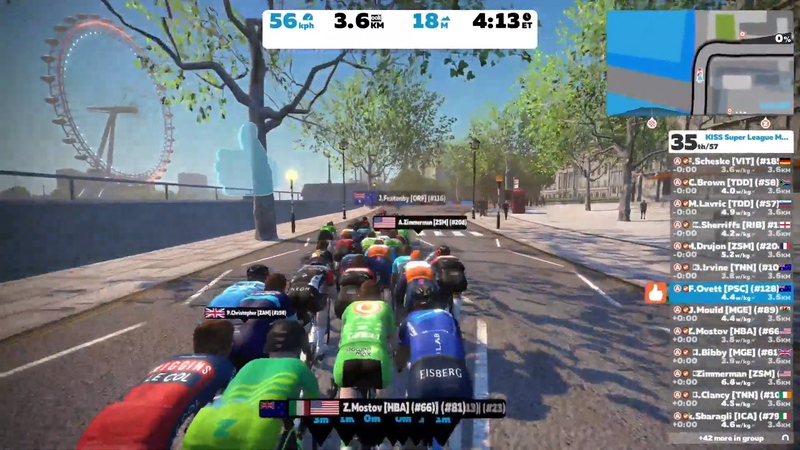 The Zwift Academy Dream Team is in second place, and the Zwift All Stars are in third. Tune in live next week for the penultimate round of the league! Please note: Race times have changed in the U.S. due to Daylight Saving Time.